"Watch for the secondary stall. You've got a 10,000 pound airplane here, your flying it" I am severely behind this 5 ton jet as we move from a secondary stall into a the onset of a spin, and my CFI has made it clear this is my problem to resolve. I am in the aft seat of a Czech-made L-39 jet. 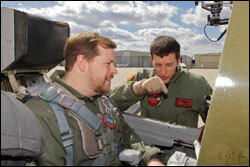 Greg Morris of Gauntlet Warbirds is talking calmly to me from the front seat. Guiding me, but letting me learn from this L-39 training experience. Moments before we departed Aurora Municipal Airport and at about 30 seconds after takeoff Greg hands control of the plane to me. 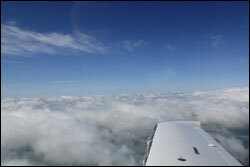 I fly us through some holes in the scattered skies, bringing us up to 14,500 feet in just under three minutes. This is my first reminder I am not in the Diamond Star anymore. If I had not already been thrown into the deep end of the pool it is time to jump right into maneuvers, there is no time to waste when you are burning two gallons of fuel per minute. The first planned maneuver is a power-off stall. As the plane slows and I pull back on the stick the plane begins to buffet. Thinking this is no different than any other stall I have recovered from I am a bit overconfident. That overconfidence, however, is short lived. Following standard procedures, I dip the nose and throw the throttle to full. Being in a powerful jet capable of 425 knots of power I figure I can coast through the rest of stall recovery and begin pulling back on the stick. Surely the thrust of this turbo-fan jet will propel us through the stall. 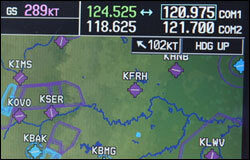 I start to feel a rumble and a shake in the aircraft and I start to wonder...did I push throttle in too fast? Was I supposed to go from zero to full power in a jet? I misinterpreted this shaking to be related to my power control when in reality it is the start of a secondary stall. As I ponder what is going on, slowly falling behind the aircraft, I forget to ensure wings are level. You know what comes next, the right wing dips and we begin to spin to the right. Instead of grabbing the controls, Greg calmly talks me through the spin recovery, but I am frazzled and it takes a little longer for my brain to react to my previous training and Greg's coaching. Sure enough as offset the spin with the rudder pedals and bring wings level the speed builds up and I bring the plane back to straight and level flight. Turns out I had incorrectly assumed that if I tossed the power to full the jet would accelerate through the stall. Greg later explains a combination of L-39's fuel control system, which regulates acceleration, and the sheer weight of the plane makes it take longer than I expected to accelerate. I learned that the same stick and rudder skills used in a Cessna 152 are required to fight off a stall in this turbo fan jet. I learned this lesson well thanks to Greg's patience and coaching, it comes natural to him after 10 years of instructing. He asks if I would like to try it again...Hell yeah. 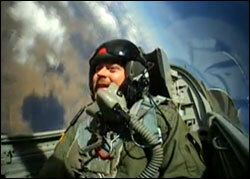 Prior to departure, Greg and I discussed my experiences with aerobatics and resulting G Forces. A few years ago I had the opportunity to perform aerobatics with Ben Freelove of Tutima Academy in an Extra 300. In that flight it was a thrill to experience 7Gs without too much strain. Greg explained the biggest difference between aerobatics in Extra 300 and a jet was going to be duration. In an Extra 300 the maneuvers are quite quick, resulting in a few seconds of G Force influence. In the L-39 the power curve causes a longer-lasting G Force impact. To minimize the time spent snoozing in the back as a result of G-Loc (G induced Loss Of Consciousness) I was taught the "Hook" breathing maneuver. In combination with tightening my leg and abdominal muscles I was to take in a deep breath then slowly to exhaling while forcefully saying the word "Hook", holding the final K for a few seconds then pushing out a final exhale with the "Ka" sound and then repeating. Greg also explained that if I felt uncomfortable or started to lose consciousness I should say "knock-it off" and he would end the maneuver as quickly as was practical. I was able to put this method to the test when Greg took over the controls to show off the performance capabilities of the L-39 Albatros. During a Half Cuban Eight we put 5Gs on the plane and our bodies. The Hook method worked well and I felt great. Greg then put me through a tight break turn that increased the G Forces to 6.5Gs. Prior to the maneuver I figured I would be fine having successfully made it through 7Gs the summer before. Just then we rolled out of the turn, I had just barely made it through the maneuver consciously. Another few seconds and I would have been doing my best Reagan National Air Traffic Controller impression. I would have sworn we were in the turn for half a minute but video replay proves the maneuver was just over 10 seconds long. I did not call "knock-it off" not because I was too macho, but more out of lack of full understanding of the situation. I give great props to the men and women who do this for a living and folks like the Blue Angels who do these maneuvers regularly without the aid of G Suits. In our 45 minute flight training experience we burned 101 gallons of fuel. I don't think I burned that in my last four flights in the Diamond Star and not something one could afford to do regularly. But, I wouldn't have traded this experience for the world. The opportunity to fly the L-39 was a once in a lifetime moment and a great learning experience. I would like to thank Greg Morris and Gauntlet Warbirds for having me out to checkout their world class outfit. If you have any interest in learning aerobatics or training to fly a warbird like the T-6 Texan or a jet like the L-39 Albatros I cannot recommend Greg Morris and his staff at Gauntlet Warbirds enough. I would also like to thank MyTransponder's Mike Miley for coming out and taking some amazing photographs from the day. Check out his photos on Flickr and enjoy a few in-cockpit videos from the L-39 experience below. John Purner, author of The $100 Hamburger, released a list of the top 17 $100 Hamburgers as voted by his subscribers in 2011. His book highlights nearly 1,700 Fly-In Restaurants nationwide. Last month he reached out to his 50,000 subscribers to ask them to select their favorite $100 Hamburger. After receiving a record number of votes seventeen restaurants pulled away from the pack and have been labeled "The Best of the Best" for 2011. I was disappointed not to see Sky Manor, Pittstown, NJ or Sky Galley, Cincinnati, OH on this list this year. 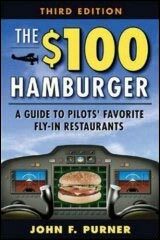 You can view a list of $100 Hamburger joints I have flown to on Yelp. Which $100 Hamburger spots do you think should have been on this list that weren't included?